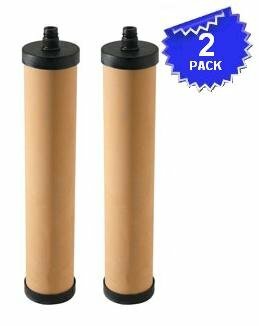 Replacement filter for u.1812 filters system. Also for use with country kitchen filter faucets a1435 and a1635. Meets nsf42 and 53 for chlorine and lead reduction. Complies to nsf61, sec. 9. Filters to 0.2 microns. Reduces cryptosporidium parvum, e. Coli, salmonella, and other bacteria. Made of ceramic, silver, carbon and zeolite. Reduces particulates, improves taste and reduces all heavy metals. Reduces pathogenic bacteria, cysts, turbidity, organics, foul tastes and odor. Also reduces insecticides, herbicides and hydrocarbons. 1,000 gallon capacity.